There's an inverse relationship between soup sales and the temperature outdoors. As one goes down, the other soars. That's why falling leaves precipitate Crock-Pot thoughts and every ski resort eatery offers a steaming soupe du jour. There's another reason: Soup has been around since the beginning of time; the earliest evidence of a thickened savory liquid — hippopotamus stew — dates back to around 6000 B.C. It took the French, of course, to make it an art. "Consommé" held its own at the table until the Great Depression gave soup a bad name. Then came the Campbell's craze. It wasn't until the '60s, when back-to-the-landers got back to basics, that people began to rediscover the potential of potage. Think of soup as a side dish, something to precede a meaty main course? These days, with nutritionists touting the healthful properties of a well-composed tureen, cookbooks with names like Soup Suppers and The Daily Soup abound. Restaurants reflect the trend. As a convenience or take-out food, soup lacks a certain, well, portability. But if you're willing to risk some sloshing in the container, or to opt for a frozen version, the possibilities are endless, from the bracing hot 'n' sour to the minestrone or stew that's a meal in itself. Appropriately, considering its climate, Vermont boasts quite a few restaurants where soup's always on. Here's a sampling of some where soup is more than just another item on the menu along with some recipes. When Chef Alex Marko moved to Vermont to be closer to his family, he decided to open a casual restaurant that specialized in soup. "I sort of felt — before the age of global warming, when Vermont had more severe winters — that soup would be a good sell here," he explains. The winters have warmed up, but the restaurant is still cookin', with its roomy dining room and laid-back, family-friendly atmosphere. "We don't want to be too pricey," Marko says. "I'm more into feeding people than impressing people." Feed folks he does — with six standard soups, plus a pair of daily specials. Variety sets Alex's Restaurant apart; so do the larger number of vegetarian offerings, perhaps because Marko himself is a vegetarian. Meat is easier to leave out than fat, however. "We're a little heavy into the cream soups," Marko confesses. Not all the ingredients are local — notably the beef. But Marko says that "like everybody else . . . I try to stay with local produce when I can, and for sure the local dairy products. . . It's just my little place." His goal, like his main offering, is humble. "We like what we do and we like when people enjoy themselves." This simple, sweet soup has "a nice pumpkin color and flavor," says Marko. "I don't put any salt in it, so it's a little dessert-y." Marko, who is diabetic, doesn't get to sample the soup. But if customer response is any indication, he's doing something right. "Everybody asks me for the recipe," he boasts. And he's always willing to give it out, because he "likes to spread the joy around." Blend all ingredients together in a pot. Heat until hot, but not boiling. Serve. It's not unusual for the Fresh Market to sell out of soup. One day last week, two popular varieties were gone by 1 p.m. "We'd had almost eight gallons of soup out there," marvels Jamie Nelson, who has worked on and off for three years at the South End gourmet grocery. Every day, the Fresh Market kitchen churns out two different soups, one of which is always meat-free. There's also chili, which alternates between meaty and veggie versions. When customers don't scarf up all the soup by closing time, employees "portion it into two-cup containers and put the containers in the freezer," says Nelson. "On any given day, we may have up to 20 different kinds of soup in our freezer." When the freezer's packed, it's time for a buy-one-get-one-free sale. "Those days are always hectic," he says, grinning. "There's usually a line out the door." Why the run on the hot stuff? Soup is "part of our culture here," says Nelson. And it sure doesn't hurt that cooks at the Fresh Market "try to use all fresh, local vegetables, which we sell here all year round," he goes on. "We use Misty Knoll chicken to make our chicken stock." Have a super soup concept but don't want to prepare it yourself? Just ask. "The public is always open to suggest something, and we'll put in on the menu," Nelson says. This warming soup is like antipasti in a bowl. Dice the carrot, onions and celery, setting each aside separately. Heat olive oil in a large stockpot over medium heat. While oil is heating, dice the salami. Add salami and pepper flakes to the pot and cook for two minutes. Add celery and carrots. Cook, stirring, until nearly tender. Add onions. When the onions are translucent, add all remaining ingredients. Bring to a boil, reduce heat to keep the pot at a simmer, and let simmer for 15 to 20 minutes. Serve with French, or any other favorite, bread. When Betsy Vick lived in California, she was a fan of noodle shops. There, in the Asian-American tradition, each bowl of "soup" came with pre-set ingredients: A #5 might hold rice noodles and shiitake mushrooms, while a #8 contained brown rice and strips of beef. When she relocated to Vermont, Vick decided to recreate the experience, but with a DIY twist. "We have five different broths," she explains. "The curry is creamy;" the chicken, lemongrass, mushroom and miso are "brothy." The process is easy: Select your fave, pick a protein, a starch and five veggies, and you're good to go. Vick makes sure that the options go beyond the standard local chicken and beef. There's also fish, tiger shrimp, duck, mock duck and organic tofu. "Being in a house or kitchen with a bubbling pot of chicken stock is one of the best smells," enthuses Park Squeeze Chef Sanderson Wheeler. "We make chicken broth here, entirely from scratch." Roughly chop vegetables. Combine all ingredients in a stockpot and simmer it for about four hours. Strain. Add a little bit of soy sauce and salt to taste. In major cities, restaurants have served "pho" — pronounced "fuh" — for decades. 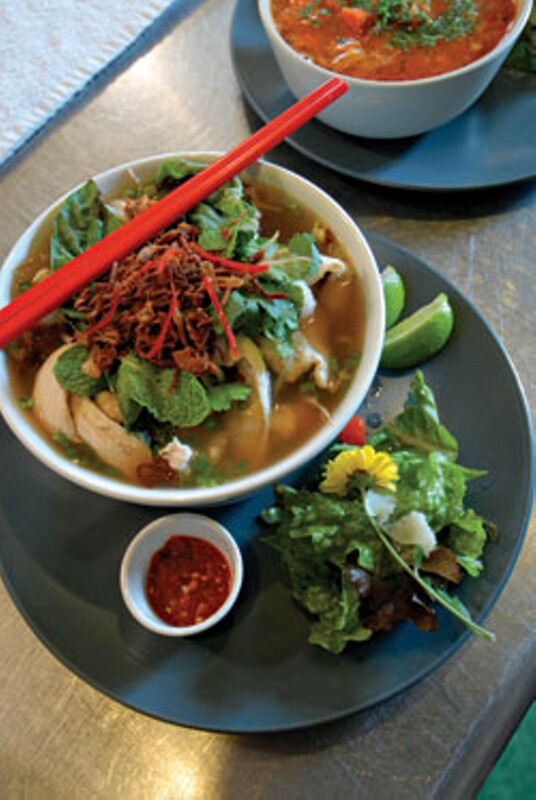 But in Vermont, you've got to search for this hearty soup, a Vietnamese dish influenced by French cuisine. 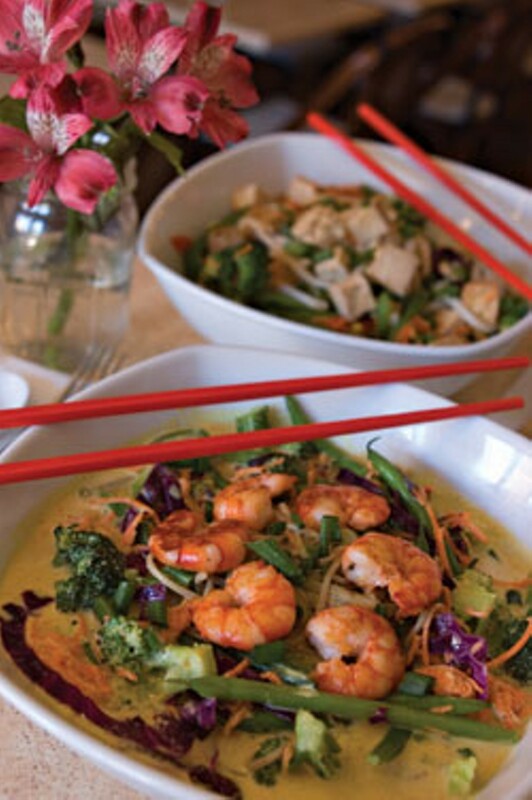 Two places to find it are Essex's Vietnam Restaurant and Winooski's Pho Dang, where it's the main course. At Pho Dang, everything is made from scratch, says staffer Jade Le. "It's beef, and usually they boil the beef bones overnight, and that's why the soup has a sweet taste," she explains. The restaurant sells so much that its cooks make "four big pots every day, three beef and one chicken." Noodles and strips of meat float in savory herbal broth, which the customers top with bean sprouts, squirts of lime, fresh herbs and a variety of sauces to taste. Le confirms that Pho Dang's most popular offering is not the pho version that comes with tripe and tendon — customers prefer a Vietnamese variation on homely chicken noodle soup. "American people like chicken," she points out. "They say everything tastes like chicken." Business at Pho Dang was good even before the cold weather quickened the pace. On a recent chilly day, Le says a pair of customers told her that "they woke up early in the morning, and the only thing they could think of was hot soup." Just like coffee people say you've gotta grind your own beans, soup people gush about making stock from scratch. When cooks take short-cuts, "the soup doesn't really turn out," insists That's Life Soup owner Pam Root. Because she goes through so much of her own fresh broth each day, Root always has a 30-gallon pot of veggie stock simmering away. She calls it the "universal donor," because she can use it to thin or enhance any soup, any time. The stainless behemoth boasts a spigot on the bottom — a must, since it's too heavy to lift and pour when filled to the brim. "Some people really appreciate soup, and they know what goes into that process," Root goes on. Clearly, she's one of those people. A 15-year veteran of Ben & Jerry's, Root used to spend a lot of time on the road. When she got home, a homey bowl of soup was often the first thing on her mind. After her son left for college, Root started giving her soup away to friends, who liked it so much, they suggested she open a business. Cooks at TLS make two new soups each day, choosing from a repertoire of hundreds. In fact, "We try to make one completely new kind each day," says Root, though she admits to occasionally honoring customer requests for favorites. "This week, someone requested Greek lemon chicken, and another requested mulligatawny" — a "pepper water" soup featuring chicken and curry flavors that came out of British-controlled India. Though some customers are surprised by the unique selections on the menu, they tend to be pleased once they start slurping. "It's such good food. It's comforting. It's healthy," says Root, with the passion of a born soup evangelist. "There are people who say, 'You've opened up my horizons to soup. I used to just think of chicken noodle.'" Heat the oil in a sauté pan. Sauté the onions for three minutes. Add the minced garlic and sauté for another minute. Add the jalapeño peppers. Sauté until onions become translucent, around five minutes or so. Add cumin, oregano and cayenne. Stir. Cook for one minute. Heat the stock in a stockpot. Add the onion-pepper mixture, then add shredded chicken and white beans. Heat until hot, 10 to 15 minutes. Don't overcook. Add 6 cups Monterey Jack cheese; heat until that melts. Serve, garnished with leftover Monterey Jack and fresh Italian parsley.